Like I said yesterday, today was gonna be a bbq day. WOOHOO!! Got my slab of pork baby back ribs rubbed last night and ready to go. This morning, I got up about 8:30, fixed up the old Weber Silver (WS) with the Smokenator and the IQ100 and fired that sucker up, set at 250 degrees. I took the ribs out when I started setting up and let them warm a bit. 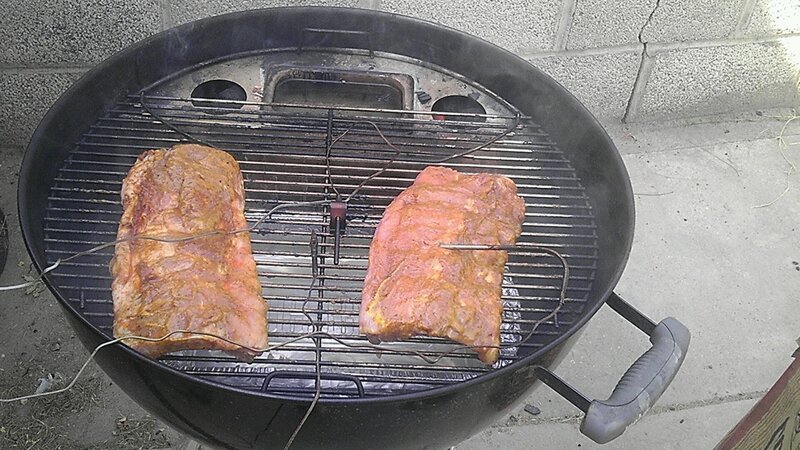 About a week before I started my blog here, I tried cooking a couple of slabs of ribs, using the WS and the Smokenator. Six hours later, they were still kind of tough, so I finished them in the oven. When I had my old Outdoor Kitchen keg cooker, I was able to get them done in about 2 hours. Tender, juicy, high and fast. I did a bit of research and talked with a friend and co-worker and came to conclusion I needed to “foil” the ribs (aka Texas Crutch) to get them really tender and juicy. Today I put them on the WS, meat side up, for 1 hour after getting the Smokenator and IQ110 going. Then I flipped them and let them go another hour after adding more water to the Smokenator. 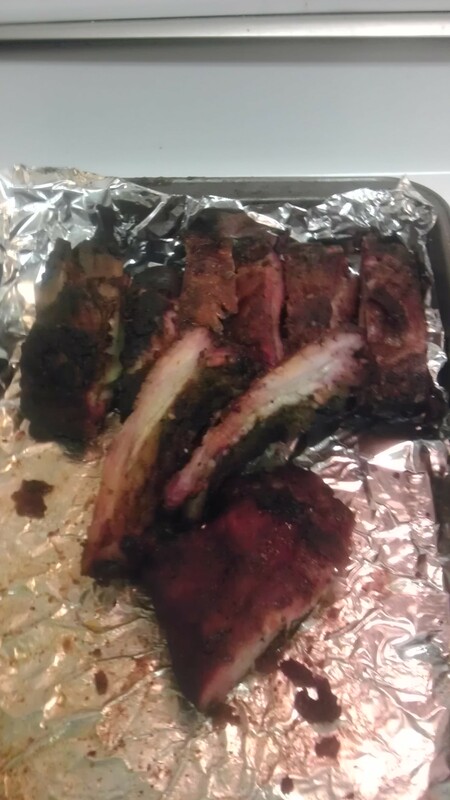 I got a double layer of foil for each of the 2 mini-slabs and put the ribs in (of course, something had to go wrong. I didn’t have any wide foil nor did I have any apple juice, but Sweetie went out and braved the insanity at our local supermarket and came home with both of them. Thanks tons, Sweetie! Love ya!). I squirted a little Sweet Baby Ray’s regular bbq sauce on top and folded it all in the foil and closed it tightly except for one end. I poured in about 1/2 C of Apple Juice into each through the open end and then sealed the last end good. I put both rib sections back on the WS for an hour and a half (more water in the Smokenator). I checked them at 1 hour and they weren’t quite as tender as I wanted, so I let them go another 30 minutes after adding water to the Smokenator. After 90 minutes in the Texas Crutch, I took them out and placed them back onto the grill, yep, more water into the Smokenator. I flipped them at 15 minute intervals for the next hour. No additional sauce was put on them. The water in the Smokenator kept the humidity inside the WS high and the ribs moist. 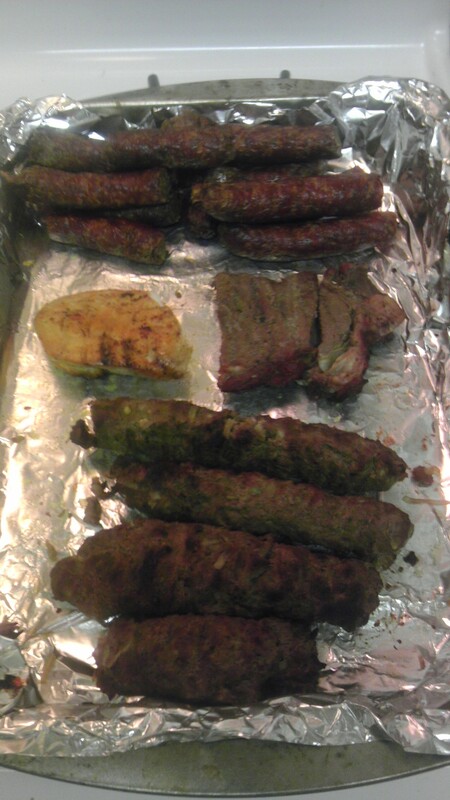 While the ribs were finishing off, I got my 2nd WS ready for indirect grilling and put on a few links of my pure pork Cajun smoked sausage, a seasoned chicken breast, a ribeye steak with Outback seasoning, and 4 kaftas. Kafta is a middle eastern dish, usually made with ground lamb and Middle Eastern spices. I used regular ground beef instead of lamb. I flipped all the stuff on the 2nd WS at 15 minute intervals, too. I put the kafta over the coals to cook. The rest was laid out all over the cooler part of the grill. Just before the ribs came out of the Texas Crutch, I fixed up a little bowl of bbq baked beans, some dirty rice (used both ground beef and chicken livers since it was my day! LOL) and some deviled eggs. I also sliced off a hunk of French bread, sliced it about 1/2″ thick and buttered and garlic powdered a little over half of it (Sweetie doesn’t do butter), wrapped it tightly in foil and set it aside. When the 2nd WS stuff was about 15 minutes from being done (3 flips), I put the bread over the coals on top of the kaftas. I did the steak and chicken via reverse sear. The sausage I just let warm up and cook. I didn’t have a thermometer to see how hot the 2nd WS was, but it was probably medium heat…400 or so. 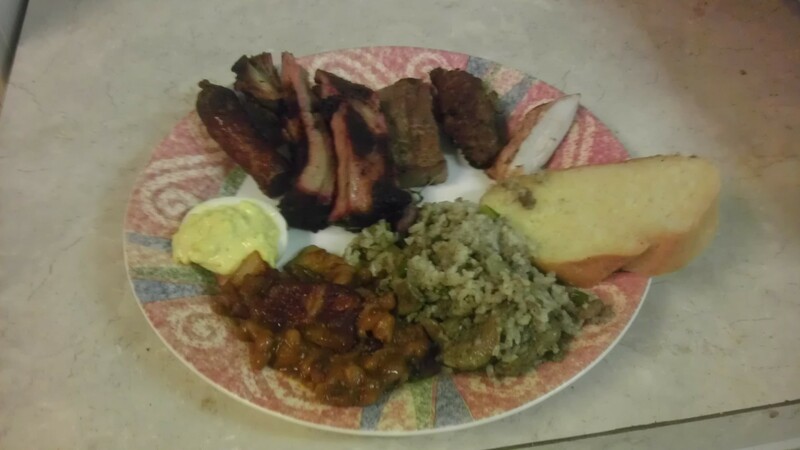 The beans, dirty rice, deviled eggs and garlic bread were the perfect sides for this meal. All in all, it was a darn good Father’s Day. And it wasn’t heresy this time! It was just darn good bbq.